What a splendid idea it was to take the 62nd independence anniversary celebrations to Tamale! The planning of the event must have been hampered by short notice (the idea, no doubt, having been inspired by the ceremony held at Tamale recently to mark the peaceful settlement of the protracted “skinship” dispute in Dagbon). And yet the 6th of March 2019 event was remarkable for its success. It gave those who hadn't been to Tamale for donkey's years an opportunity to see on TV, some of the developments that have transformed Tamale from a “backyard” into a modern township with considerable prospects for growth. Indeed, if the proposed railway link with Southern Ghana materialises, yam and grains, sheep, goats and cattle, can all be transported cheaply and speedily to markets in the South. The reverse would also be true: goods cleared at Tema would reach the North in a matter of hours, instead of weeks. More of the businesses in our landlocked neighbourhood would also benefit. All those trucks from Burkina Faso, Niger and Mali won't need to travel all the way to Accra-Tema any longer. And our trunk roads will become safer. Was it not a most astute strategic gesture for our President, Nana Addo Dankwa Akufo-Addo, to invite the President of Niger, H.E. Mahamadou Issoufou, to be his guest of honour at our 62nd independence anniversary celebrations? Mr. Issoufou is a very old hand at West African politics. He can fill in the gaps that inevitably occur when complex political problems arise in the region. He's been in office since 7 April 2011. Before then, Mr. Issoufou had been Prime Minister (1993-1994) and President of the National Assembly (1995 -1996. Before becoming President in 2011, Issoufou had been an “Opposition Candidate” in each presidential election since 1993. Eight years elapsed before he was able to lead his Niger Party for Democracy and Socialism (PNDS-Tarayya), to victory and the presidency. His predecessor as president was, Mr. Mamadou Tandja (1999–2010). I would like to know why the simultaneous translation of his speech that was being offered was dropped after a short while. You do not invite a prominent guest to speak and then leave him to make a speech that's incomprehensible to most of his audience. It is true that Niger cannot “retaliate” if ever our President is invited to speak from the podium there in future, as our president is bilingual. But it would be wise of our state protocol people to appreciate that not every African leader enjoys that privilege. By the way, who drew up the time-table for the Tamale celebrations? The displays were magnificent, yes; but many of the events took too long. Why did the physical exercises – mainly people tumbling over each other at speed without clashing – have to go on and on and on? After all, each pair of participants did practically the same thing as those before them? And who told the eloquent young lady who was versifying Nana Addo that she had all year to do her stuff? It was a most instructive demonstration of how drums can imitate the human voice both in the North and in the South, but it did rather go on! Sadly, I learn that several people were overcome by heat and/or fatigue, during the event. Their bodies spoke for them and so it is important for the planners of such events to learn not to subject performers to extraordinary long stints, at full stretch. One thing I can commend state protocol for, however, is its decision to include some past heads of state in the celebrations. At a time when the political ether of Ghana is filled with static noises regarding the existence of political vigilantism, it was good to see that respect towards VIPs – whatever the parties they belong to — was not lost at the celebrations. Long may such exhibitions of national unity continue! 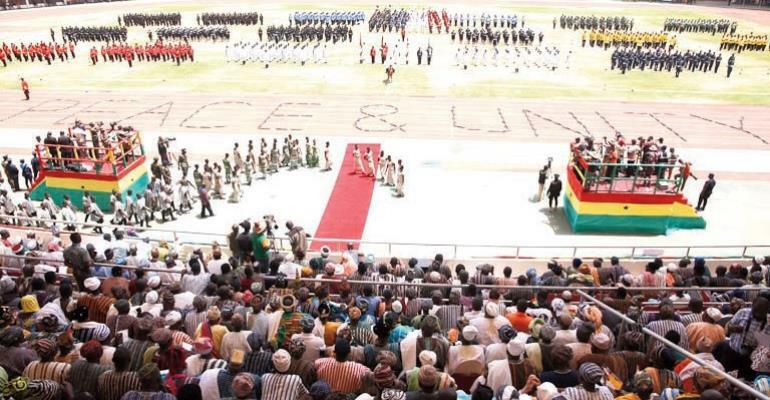 Even so, it is claimed by the NDC that the presence of its leadership was ignored, nay “censored”, by the state broadcaster in its airing of the ceremony. If that's true, then GBC must hang its head in shame. GBC belongs to the nation, and was brought up by its mother, the BBC, to be impartial and balanced in its coverage of all national events. In any case, what does GBC think it stands to gain by ignoring the Opposition (if it did!) when the Opposition will be covered, anyhow, by the other broadcasters? Finally, I throw this question open: are such ceremonies as the Tamale one really necessary? Should we rotate the independence anniversary celebrations or other events that touch on our nation's history? The answer is A Big Yes! You cannot wish national unity into being, but you can help the process by deliberate acts of an organic nature. Come to think of it, the one body that's most in need of such recognition from the populace as may be won by a rotation of venues is — our Parliament. At the moment, our Parliament sits in Accra; its members speak to one another in a foreign tongue, using expressions that trace their roots to the past of another country. “I move!”; “Point of order!”; “Withdraw!” “Laying Papers”– would expressions like these be understood in say, “Brekum Forest”? Why not take our MPs to “Brekum Forest” to find out for themselves?